Everyone needs an Uncle Bill and Auntie Audrey. 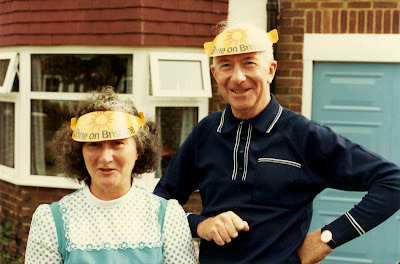 They've both gone now, but until Bill’s demise this month, for the entire lives of four generations of us, and all but twelve years of my mother's life, they've loomed in our family like imaginary friends of the very best kind. They were real of course not imaginary, but Bill, Audrey and our parents, were destined never to meet despite a lifetime of being so close, leaving a touch of surreality about their relationship. Audrey lived on opposite sides of the world to my mother, half a century and more before computers and email were to be invented, and closer to a century before video chat. At some time in the 1930's, wen both were twelve years of age, they began to correspond. They became what was known as "Pen Friends", which if one thinks about it is very much like logging on to Facebook, except the messages were longer, and took three months to deliver by sea mail. It’s hard in this era of instant communication to imagine a communication method that provided the answer to a question six months after it was asked, but that’s what being a pen friend meant. Writing letters by hand, licking stamps and leaving them in a pillar box where they would by some magical means be transported halfway around the world to another little girl in an unimaginable country, was how it was done. Monthly correspondence passed on ships in the night. War arrived, and my mother sent relief parcels from Australia to Audrey’s family in war-torn England, they remained in their own countries, grew older and eventually married all the while keeping up their regular communications. Their respective husbands became part of the friendship. When my mother produced children, it was natural that we should be adopted by an Auntie and Uncle whom we’d never met. They would send us marvelously exotic parcels to us each birthday or Christmas wrapped in battered brown paper and string with a green customs sticker on them hinting at the contents, and stamps from England that would be soaked off and left to be lost on the kitchen window sill. Books and toys from the other side of the world. We’d write in return to offer our thanks, and our incredible family from the other side of the world became closer and the communication network broadened. Airmail became economical, and the letters became Aerogrammes, a lightweight folded tissue paper, on which Mum and Audrey would type their correspondence on ever blank space, with single line spacing and no paragraph breaks to get more words in. With a little luck, they'd arrive within a few weeks of being posted. When Bill and Audrey went abroad, we’d receive photos, we knew all their relatives and the state of health of each of them, and they knew ours. For us their house was the thing of fairytales, it had a name of it's own, and was located in the impossibly English "Swallow Close", it was hard to believe it just wasn't part of an elaborate movie. One year, international telephony arrived and after booking a call weeks in advance because that's what one had to do to make use of the limited lines available, we phoned them on Christmas day. They didn’t have children of their own, but our extended family was their extended family, we had children of our own, they became "Great". Travel over that distance was once the realm of the wealthy and the idle, and the relationship had stood for almost half a century of before any of us had the pleasure of connecting face to face. As fate would have it, I was to be the first of our family. With the Mother of my children and the eldest (and only at the time) two of them in our little red rented car with its "Visitor to Britain" sticker on the windscreen, we turned into their driveway one fine summer afternoon in 1982. We had arrived at "Hunter's Mead", Swallow Close. We were to about to meet for the very first time. We were about to cross a bridge that was half a world long. Audrey and Bill rushed into the yard. Life turned into slow motion, we knew them so well from the countless holiday snaps. Surely this was Deja Vu. We knew the house, we knew every flower and the little concrete owl, everything was eerily familiar. They were, well they were them in their socks and outdoor shoes with their skin the colour of fresh milk. Oddly, she was dressed to exactly match the colour of the door of their garage, although that didn’t seem at all odd at the time, they were English after all.